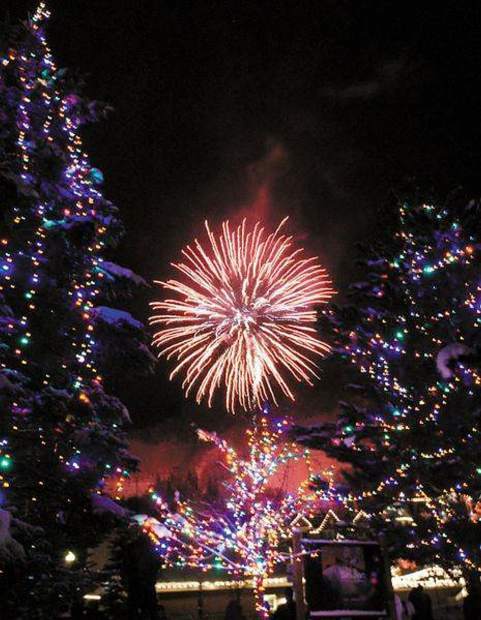 Paul Conrad/The Aspen Times Two lighted trees frame fireworks Saturday evening Dec. 8, 2007, above Aspen Mountain. “Roman J. Israel, Esq.”, 5 p.m.
JAS Café at the Aspen Cooking School, 7 and 9:15 p.m. Belly Up Aspen, 10 p.m.
Race on Aspen Mountain, 9 a.m. to 2:30 p.m.
Afterparty at Shlomo’s, 3 to 6:30 p.m.
“In the Fade”, 5 p.m.
“Three Billboards Outside Ebbing, Missouri”, 8 p.m.
Wheeler Opera House, 4 & 6:30 p.m. Doors open at 7:30 p.m. for open bar and light appetizers, concert starts at 9:30 p.m.